LANE4 Property Group partnered with KC Jazz ALIVE during Jazz Appreciation Month in April. Each restaurant at 39Rainbow donated a portion of sales to KC Jazz ALIVE to preserve and promote jazz in Kansas City! We are so lucky to have such a wonderful partnership with LANE4! 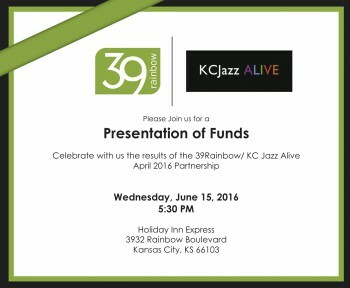 Join us THIS Wednesday from 5:30-6:30pm for the presentation of funds to KC Jazz ALIVE inside the Holiday Inn (3932 Rainbow Blvd). This entry was posted in Awareness, Event, Exposure. Bookmark the permalink. ← Tour De Jazz Coming in August 2016!